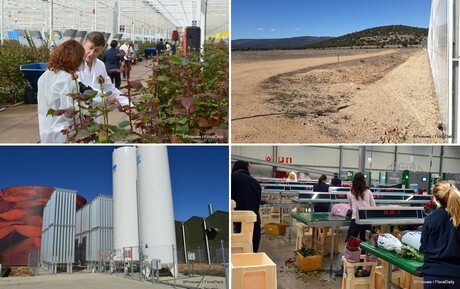 In Soria (Spain), at an altitude of more than one kilometer, Aleia Roses grows the Red Naomi rose. And that's unique. Not only is there there no other grower anywhere in the vicinity, they're also doing something special in terms of vision, scale and technique. Spanish entrepreneur Luis Corella, who owned a large tomato nursery in Mexico at one point, had a plan to grow 'the most beautiful and best rose in the world'. Where, he wondered, was the best place to do that? In the Netherlands, because of the horticultural knowledge they have there? Or around the equator, which is where many Dutch growers went? Or could it be possible to find an optimum elsewhere in terms of climate, technique, people and sales opportunities, in addition to having 'the most beautiful and best rose'? We were invited for an extensive tour - click here for the photo report. So he ended up in Spain - Soria, to be precise. There's lots of sunshine, altitude, and water (with both rainfall and a river nearby). The humidity is also low. At the same time, it's closer to the Dutch flower auction than Kenya, not just in terms of physical distance. In 19 hours, flowers in buckets with water can be transported to Aalsmeer by road, control over the entire operation is far greater, and there's relatively easy access to all technical support imaginable. Automation, including two Bercomex Furora lines, has been implemented to a T; watering and purification, climate control, crop protection and greenhouse technology is state of the art, and labor, energy, infrastructure, and soon even the CO2 from a nearby bio energy plant, is present. And although Spanish bureaucracy might not always be easy to deal with, they are and feel very welcome. In short, a solid foundation from which the enormous operation - under 14 hectares of glass, 40 million roses are grown annually - can grow into a successful business. The question is, first of all, whether they'll truly succeed in growing the 'most beautiful and best rose in the world', and secondly, whether they can make a profit in the process. And they can. "We had to learn quite a bit, especially in terms of labor. Before we came here, nobody knew anything about roses or horticulture in general. We're getting better and better at that though", says CEO Dirk Hogervorst. "What's essential, however, is that we succeed in growing Red Naomi here, better than in the Netherlands or anywhere else. Especially in the winter months, the quality really is better. That's not just apparent from our tests, but also consistently shown by FlowerWatch, Wageningen UR and Royal FloraHolland. Also, the crop only recently got to the point where our heaviest quality can be sold under the brand Aleia Máxima." So do they have a so-called holy grail here? It's too early to say that at this point. But it's clear that there's promise here, as should also be apparent from our photo report.